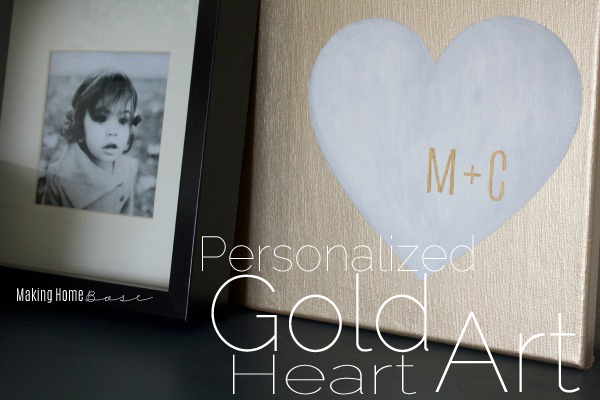 Gold Heart Personalized Art for Valentine’s Day… or not. I kind of love art with special meaning. Personalized art, pictures colored by my daughter, and things we’ve created are my favorite things to display around our home. Those pieces can’t be duplicated, or purchased in a store, making them way more significant. 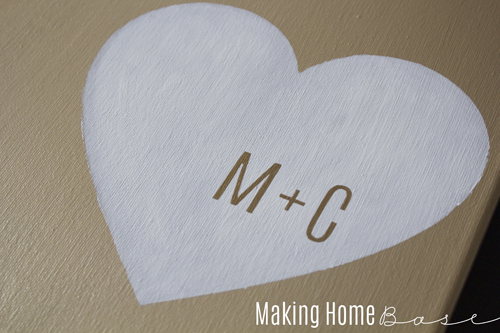 I had an idea to do a couple’s art canvas for Valentine’s day but I wanted it to be able to transition it to my bedroom afterwards. And because gold is my new obsession, I had to go with gold. It’s perfect for Valentine’s day but it also looks amazing in my bedroom as well! Do you know what I’m talking about when I say couple’s art? I don’t know if I’m making that term up or not but it’s like the M+C in a heart kinda thing. Ya know? I just love those kind of things -they are super cutesy but still sophisticated, I think. Anyway, I’ve seen prints like this all over Esty for $20+. I managed to make a canvas for $0 because I had all of the supplies at home. Perks of being a craft supply hoarder I suppose. Even I had to purchase the supplies for this project I still could have done it for less than half of the prices I’ve seen on Etsy; and you know that I like a cheap project! 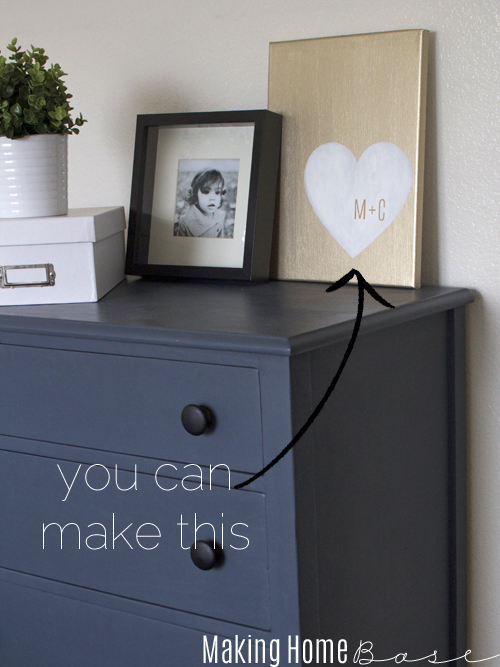 Paint a blank canvas with gold metallic paint. I used Martha Stewart brand. It took three coats for full coverage. Also, create a heart stencil. This is really easy if you have a Silhouette. If you don’t – check out PicMonkey.com and their “Design” feature. You can create an image that is 8×10. Use the Overlay feature to make a large heart. Print and cut. If you have Word, I’m sure you can find a heart clip art and make a stencil that way as well. Place the stencil on the canvas (once it’s completely dry) to paint. I offset mine a little bit because I like that look. 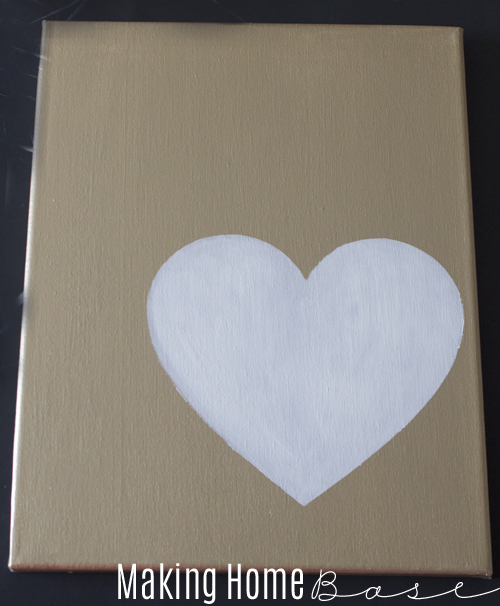 Paint the heart with white craft paint. About two coats for full coverage should be about all you need. Remove the stencil and touch up any areas that may need it. Now you are ready for the “personalized art” part. I used my Silhouette to create a quick stencil for the initials but you don’t need it. 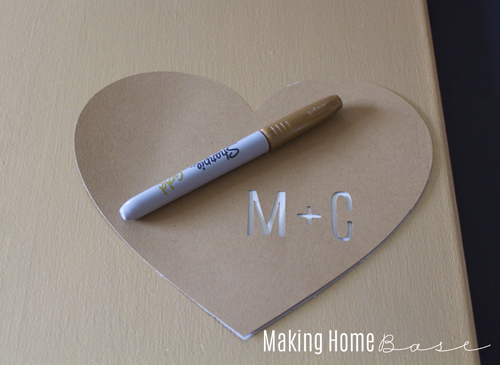 A gold sharpie and a steady hand will be just fine! I colored the stencil in with my gold sharpie (I love love love the metallic sharpies!). 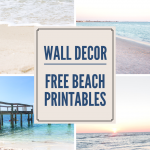 Check out how I’m displaying it in my bedroom gallery wall. 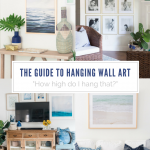 Do you have any personalized art in your home? Somethings that you’ve created that are extraordinary? I’d love for you to share them with me! You can post a picture on Instagram and tag me at @makinghomebase. You can also share them with me on Facebook! Too freakin’ cute, Chelsea! Love it! This is adorable!! I want a Silhouette SO bad haha. I love simple canvas projects like this. Chelsea… you already know I’m in love with this. So pretty and cute. I have to make one of these! So simple and chic. I am loving gold these days too. Pinning! Adorable!! Love that. And it doesn’t just have to be for Valentine’s day. Show the love all year ’round :). I love it! Looks so chic in gold! Oooh I LOVE this! So chic and beautiful! Sharing for sure! Thanks for the inspiration, Chelsea! This is gorgeous Chelsea! So simple and elegant, I love it. 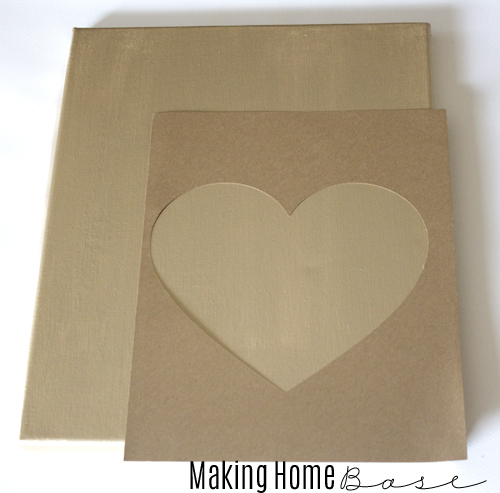 It is really hard to find a good gold paint but I have never tried martha stewart, I will check it out next time. Thanks so much for sharing. Love this, it’s so simple, modern and pretty! That is so cute! I’ve been loving gold lately too and this would look great in our bedroom! I love this Chelsea! I really need to make something with gold! 🙂 Love how it can be left up all year long. 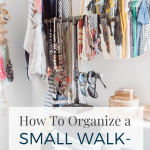 Thanks for linking up at The Inspiration Exchange – we’ll be featuring it on the weekend! Love it Chelsea! thank so much for sharing this at Catch as Catch Can!